The Ocean Stars Trust was established in 2005 following the Boxing Day Tsunami of 2004. It is dedicated to supporting small isolated communities in Sri Lanka, where there is little government aid – with a focus on helping children through education and social enrichment. By raising funds to go towards buildings, teachers, uniforms, play equipment and teacher training, Ocean Stars inspires hope and joy and meaningful friendships – as well as helping to ensure that young Sri Lankan children are able to enjoy equal opportunities. Every year, the Trust sends enthusiastic teams of volunteers to visit various projects and schools in the country. To date, Ocean Stars has sent a total of 130 volunteers to visit Sri Lanka and one of these is Sandra, Sam’s sister-in-law – who has been working with the charity for some time now, helping to raise vital funds. We’ve always tried to support Sandra’s fundraising efforts in any way we can, and for her most recent visit, we made sure she didn’t go empty-handed. 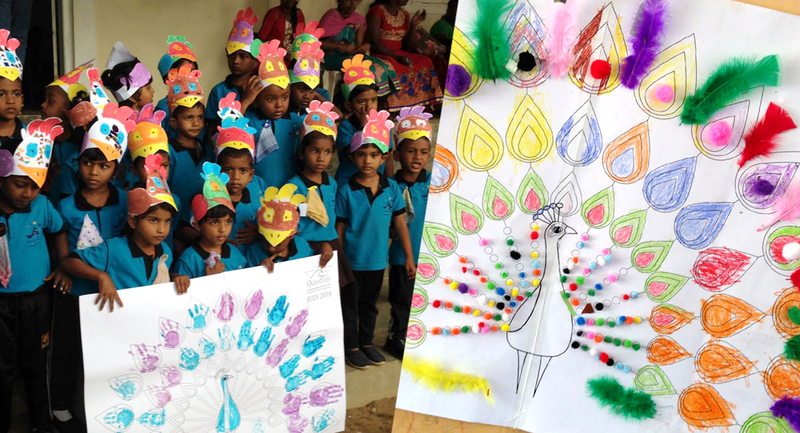 The Ocean Stars volunteers actively engage with children during classroom sessions – and so this time we designed a creative craft activity pack based on the book ‘Three Hens and a Peacock’, for the children to use after their story-telling session. And judging by the video we just received, they all enjoyed getting thoroughly stuck into the activities, which included making a hat and a peacock poster! Through strong school links and relationships, the Trust has also allowed a total of 76 students from local UK schools to experience a unique cultural exchange as they visit children in Sri Lanka. One of these schools is Calthorpe Park in neighbouring Fleet, which – as of end 2017 – will have seen five groups of students make the trip. At present, 10 preschools in the UK are also linked to 10 preschools in Sri Lanka, thanks to Ocean Stars. These links help the children to build on their awareness of other cultures and develop empathy, as they send regular pictures and letters to children on the other side of the world. The UK children also help with fundraising efforts and send various resources to their linked school – including stationery items, and gifts for the wider community such as soap, toothpaste and clothes. There are many ways people can get involved with the charity – from fundraising and volunteering to sponsoring a child or making a donation. Ella, one of the 21 students from Calthorpe School going to Sri Lanka in October 2018, has been busy fundraising and has so far raised an incredible £8,672 of her £10,000 target. Meanwhile, John and Amali are cycling from Rosslare in the south of Ireland to Derry in the north, also to raise money for Ocean Stars. If you’d like to find out more about the Ocean Stars Trust and the incredible work they do in Sri Lanka, then please click here.